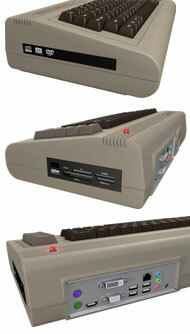 The Commodore 64 is being re-released for the modern computer user. I was just 6 years old when the Commodore 64 computer went on sale in the summer of 1982. Although I already owned a computer at the time -- a ZX Spectrum -- I remember my excitement about possibly getting my little hyperactive hands on the newly released Commodore. At the time, the Commodore computer cost $595 and came with a whopping 64 kilobytes of memory. It also contained a graphics and sound card that stood apart from other computers of the day. Now, nearly 30 years later, the Commodore brand has taken on new management and is re-releasing its flagship computer, this time with all the amenities of a modern-day computer packed inside. In its heyday, the Commodore 64 was one of the most successful home computers made, shipping more than two million units a year for almost a decade after its release. Although exact numbers don't exist, experts estimate that the company sold between 15 and 30 million Commodore 64 computers. But the Commodore 64's success was short-lived. Commodore International, the maker of the computer, declared bankruptcy in 1994 after several bad business decisions and aggressive competition from I.B.M. and Apple. Barry Altman, president and chief executive of Commodore USA, said he purchased the Commodore trademark in September of last year with the goal of reviving the company and offering a product that no longer exists. "Thirty years ago computers were an all-in-one product, with the keyboard, memory and components built inside," Mr. Altman explained. "Over the years that has changed, and we believe there is a huge potential to revive the early format." "The response has been completely dramatic," Mr. Altman said. "We've been averaging about five registrations per second on our Web site. This is from people giving us their name and e-mail address to be kept abreast of updates on the new Commodore." Some may wonder why someone would want to purchase this type of computer when a world of iPads and laptops exists. Mr. Altman says he sees two types of customers for the new computer.